The unofficial weblog of Difint. 1. 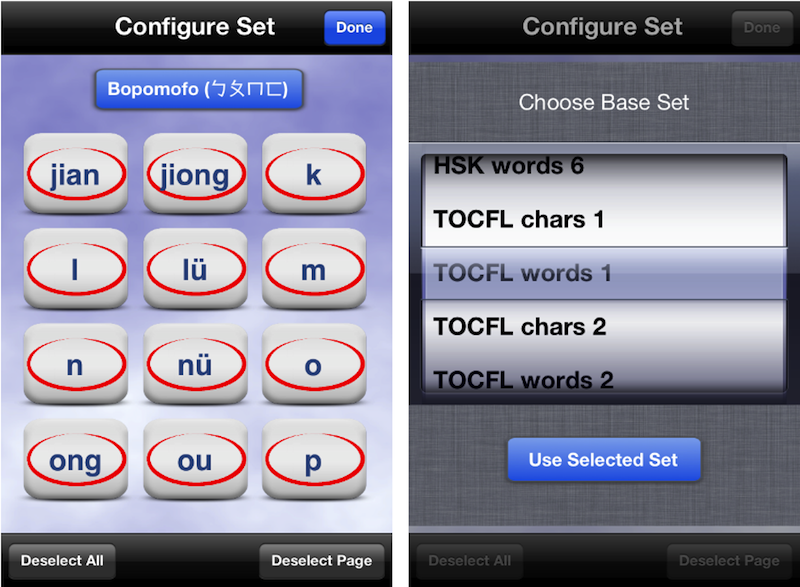 Hanzi Sets – Create customized sets to focus and direct your Mandarin learning experience. Build upon base sets ranging from beginner to proficient. 2. Basic English meanings courtesy CC-CEDICT. 3. New Arcade mode with Game Center support. The first thing you may have noticed is the new Settings interface. The following graphic gives a brief explanation of what all the new settings do. They are pretty self-explanatory. 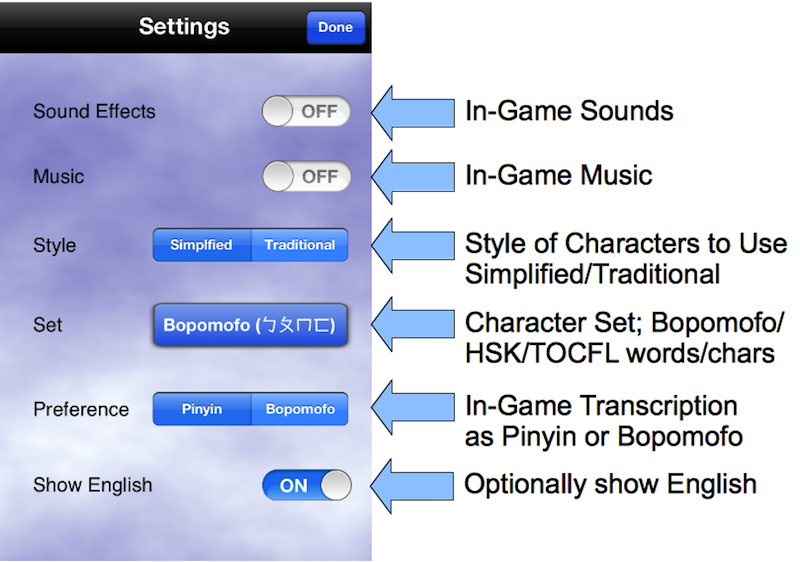 Select whether or not you want music and sound, what style of character you prefer (Simplified or Traditional), the set you will be using and selecting from (Bopomofo/HSK/TOCFL), in-game transcription (more on this later), and finally whether or not to show English on the Arcade and Train modes. Let’s first take a look at the new Hanzi Sets feature. If you tap the blue Set button (in the screen above it reads “Bopomofo (ㄅㄆㄇㄈ)”) it will bring up the Configure Set screen. From Configure Set screen tapping the same blue Set button again will allow you to choose your base set. This will be the set you will be using for training and also to play the game with. The “words” sets contain most of the words from each level of HSK* and TOCFL* exams. The “chars” sets break these words down into their respective characters so you can learn which characters make up each word. There are three other functions on the Configure Set screen. Select/Deselect All, Select/Deselect Page, and pressing the individual buttons. The Deselect All button clears all selections within the set giving you a fresh slate in which to select from. (Once you have deselected all the button will change to allow you to select all and vice versa.) Likewise the Deselect Page button clears the current Page. Paging between all the symbols in a set is as simple as swiping left or swiping right. Tapping on an individual button will bring up the character biography popup. This shows the character as well as the pinyin and bopomofo pronunciation. It also shows a simple English meaning for the word or symbol which is taken from the CC-CEDICT (Thanks for providing a great resource). This is the English that will be shown on the Arcade or Train modes if “Show English” is enabled on the Settings and a correct match is made. The new Arcade mode is a new alternative to the original Story Mode (which is still playable with over twenty-eight worlds across the four realms). If you are logged into Game Center you can compete in the three current leaderboards: Bopomofo, HSK, and TOCFL. As shown your score is determined from four parts; coverage, accuracy, a difficulty bonus (if any), and the number of correct matches. Hopefully you can make more than “1 matches.” The coverage is the percent of the current base set you are studying. For example, if you have selected 8 symbols from a set of 100 you will have 8 percent coverage. The accuracy is your percentage of correct answers versus your number of guesses. The difficulty bonus is for the HSK and TOCFL levels and corresponds to the level of difficulty you have selected. For instance Level 6 is more difficult than Level 1 and words are more difficult than chars. In addition to these three major updates there have been some minor cosmetic changes, an overhaul of the internal wordlist, and better memory usage. With Hanzi Warrior we are committed to bringing you an immersive language learning experience like no other and with your continued support and ideas we will break new ground in the Mandarin Chinese learning ecosystem. You can visit the Hanzi Warrior home page or check it out Hanzi Warrior on the App Store. 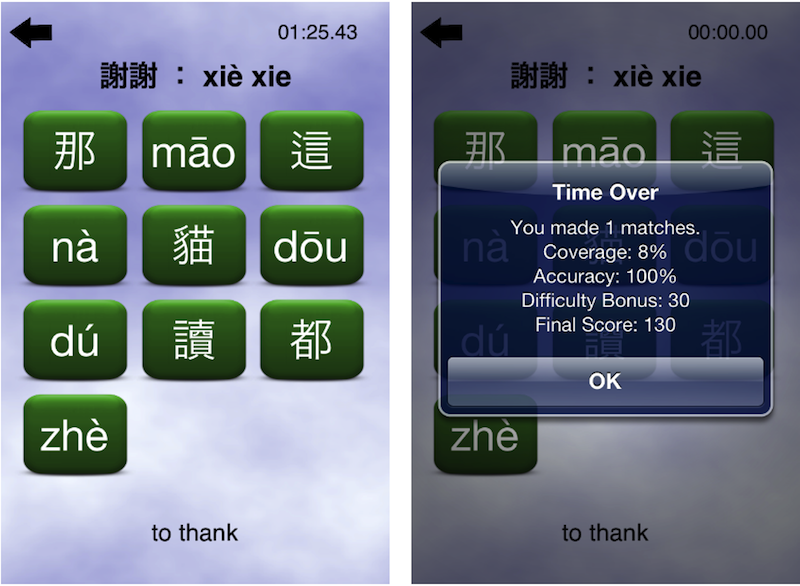 As mentioned Hanzi Warrior has Bopomofo support but if you are interested in delving into pure Bopomo action with a unique learning experience, you may also enjoy Bopomo Blitz on the App Store. Q: How many words are there? Or how advanced do the characters get? A: It basically has most all of the words from all six levels of the HSK exam (Hanyu Shuiping Kaoshi) which is the basic mainland proficiency test (~5000 words), and all three levels of the TOCFL (Test of Chinese as a Foreign Language) exam (~8500 words) which is the Taiwan proficiency exam. These range from basic words to proficient, and you can create your own sets. You can also break the words down into the characters and play the game with those (Select from the ‘chars’ modes in Settings). With all sets you can play with either traditional or simplified characters as well as get basic English meanings. There is even a Bopomofo gameplay mode. This entry was posted in Chinese and tagged bopomofo, chinese, gaming, hanyu, hanzi, hanzi warrior, iphone game, mandarin, mandarin chinese, pinyin, simplified, traditional on March 14, 2012 by difint.